Brigadier General Robinson Risner joined the Army Air Force in 1943. During World War 11, Lieutenant Risner flew P-38 and P-39 aircraft in Panama. Following the war, he served in the Oklahoma Air National Guard until he was recalled on active duty during the Korean Conflict. Risner initially volunteered for combat duty as a photorecon pilot, however, after his arrival in Korea, on 10 May 1952, Captain Risner wrangled an assignment in the new F-86 Sabrejet with the famous 4th Fighter Wing. In a brief 4-month period, he became America's twentieth jet ace. While in Korea, his combat leadership and initiative were demonstrated following an intense engagement with a MiG- 15 north of the Yalu River. As the enemy fighter crashed, Risner pulled away and saw his wingman take numerous hits from flak. With his wingman's engine shut down, Risner inserted the nose of his F-86 into the crippled aircraft's tailpipe and nudged it forward. Despite turbulence and blinding hydraulic fluid, he pushed his wingman 60 miles to Cho Do Island where he ejected near a friendly territory. Unfortunately, his wingman drowned before he could be rescued. Risner left Korea in 1953 with eight aerial victories and returned to peacetime duties. In 1965 Lieutenant Colonel Risner was assigned to Thailand as commander of the 67th Tactical Fighter Squadron. Having flown fighters for 22 years, he was now leading F- 105 strikes against targets in North Vietnam. This mission gave him recognition that featured on the cover of TIME magazine. This national publicity would become a curse for him in the near future. On 16 September 1965, while Risner was flying a Rolling Thunder mission, he was shot down and taken prisoner by the North Vietnamese. His captors knew they held an important American officer, and they were determined to break his will-to-resist with torture and solitary confinement. Throughout his seven-and-a-half-year ordeal, "Robbie" Risner's personal valor, loyalty, and faith in God and country became rallying points for his fellow prisoners and an inspiration for all Americans. Brigadier General Risner retired from the Air Force in 1976 and served as the Executive Director of the Texan's War-on-Drugs Committee. Deep over North Korea, Robbie Risner's wingman was hit by flak that disabled his F-86. Getting him to safety called for heroic measures. Brig. Gen. Robinson Risner's heroism during seven and a half years of imprisonment and torture in North Vietnam is legendary. Less known is the fact that he was a jet ace in Korea with eight confirmed victories. Few are aware, at least in detail, of an incredible feat of flying performed over North Korea by Robbie Risner in an attempt to save the life of another pilot. That courageous act is dismissed with a cuple of sentences in Risner's book The Passing of the Night. Risner's career as a fighter pilot began in Panama, where he whiled away the World War 11 years. When peace came, he joined the Oklahoma Air Guard. His squadron was called to active duty during Korea and began transitioning from P-51 s to F-80s but with no immediate prospects of getting into the war. 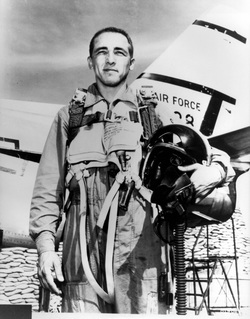 With the bare required minimum of 100 hours of jet time, Risner volunteered for combat duty as a photorecon pilot, arriving in Korea on May 10, 1952. Three weeks later, he wangled his way into the famous 4th Fighter Wing at Kimpo and into F-86s the world's best fighter at that time. On Sept. 2 1, the fast-learning Captain Risner became our 20th jet ace. A few weeks later while escorting fighter-bombers in an attack on a chemical plant along the Yalu River, Risner tangled with what he describes as the finest fighter pilot he ever encountered. From 30,000 feet to the deck they went, with Risner scoring several solid hits, then across the Yalu into forbidden territory and down the runway of a Chinese airfield where the damaged MiG-15 crashed. All the while, Robbie's wingman, Lt. Joe Logan, stayed with the fight, protecting his leader. As they climbed back across the Yalu near Antung, Logan's F-86 took a burst of flak. Fuel and hydraulic fluid poured out the belly of his aircraft. With only five minutes' fuel left, he would, it seemed, have to bail out in enemy territory. But Robbie Risner was not about to lose a fine wingman who was also a close friend. "A typical fighter pilot," says General Risner, "thinks less about risk than about his objective," and Risner's objective was to keep Joe Logan out of enemy hands. Jet ace Risner immediately embarked on an undeniably high-risk venture to achieve that objective. 'The Air Force had a rescue detachment at Cho Do Island, about 60 miles to the south-and with plenty of flak en route. Risner decided to try something that, to his knowledge, had never been done successfully before. He would push the damaged F-86 to Cho Do, where Logan could bail out safely. Risner told Logan to shut down his engine, now almost out of fuel. Then he gently inserted the upper lip of his air intake into the tailpipe of Logan's F-86. "It stayed sort of locked there as long as we both maintained stable flight, but the turbulence created by Joe's aircraft made stable flight for me very difficult. There was a point at which I was between the updraft and the downdraft. A change of a few inches ejected me either up or down," Risner, now retired and living in Austin, Texas, recalls. Each time Risner re-established contact between the battered nose of his F-86 and Logan's aircraft was a potential disaster that was made even more likely by the film of hydraulic fluid and jet fuel that covered his windscreen and obscured his vision. It was, one imagines, something like pushing a car at 80 miles an hour down a corduroy road in a heavy fog. Miraculously, Risner nudged Joe Logan's F-86 all the way to Cho Do, maintaining an airspeed of 190 knots and enough altitude to stay out of range of automatic weapons. Near the island, Logan bailed out, landing in the water near shore. Ironically, Risner's heroic effort ended in tragedy. Although Logan was a strong swimmer, he became tangled in his chute lines and drowned before rescuers could reach him. But the measure of a heroic act lies not in success. It lies in the doing. After Korea, Robbie Risner's Air Force career continued to be marked by acts of physical and moral courage, culminating in his leadership of American POWs during those long years in Hanoi's prisons. The standards of valor, loyalty, and dedication he set for himself, and met superbly throughout his years in uniform, have established a goal to be sought by generations of airmen yet to come. Published May 1998. For presentation on this web site, some Valor articles have been amended for accuracy. 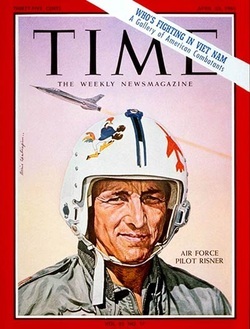 Though I had long known of Robbie Risner, fighter pilot extraordinaire, Korean War ace, first living recipient of the Air Force Cross recently featured on the cover of Time magazine, I did not actually know him. But when I heard his whispered voice under a rusty steel door in a prison cellblock called “Heartbreak Hotel,” I knew instantly who it was, and I felt, at some mystical level, oddly comforted. Yesterday, standing beside his casket at Arlington National Cemetery to pay my final respects, though sad, I again felt comforted. There was something about this man’s presence, even in death, that was reassuring. James Robinson Risner was a man of humble origins, son of an Arkansas sharecropper, educated at secondary school level, not particularly ambitious, a common man save for two things: He could fly the hell out of an airplane; and, under terribly difficult circumstances as a prisoner of war in North Vietnam, he rose to a level of heroic leadership matched by few men in American military history. Raised in a religious family, Risner made his first critical life choice between attending Bible College or joining the Army Air Forces during World War II. When he passed the tough entrance exam for pilot training by one point, he took it as a vector from God, and his future aloft was set. Flying came easily to the gifted trainee, which led to a coveted assignment flying fighters after graduation. But Robbie’s repeated requests for combat duty were ignored by the Army’s personnel system, and he spent the rest of the war defending the Panama Canal. Postwar peace and return to civilian life brought mundane employment for Risner as an auto mechanic, a service station manager and a short stint running a service garage. What mattered to him was the chance to fly P-51s with the Oklahoma Air National Guard, a path that would continue leading toward his destiny. It was the Korean War that put Robbie Risner’s name on the map of aerial warriors of that era, and became what he described decades later as the most gratifying period of his life. He finagled his way out of his recalled Guard unit into a front line air combat Group equipped with the best aircraft of the period, and paid back the favor by shooting down 8 MIGs. He also pulled off other incredible feats of airmanship. He once pushed the damaged and fuel-starved plane of his wingman with the nose of his own aircraft out of hostile skies into friendly territory for a safe bailout. That is the stuff of which legends are made. While the Korean War may have been Risner’s favorite period, it was by no means the most consequential in the lives of others. It would take another war, and an extraordinary set of circumstances for that to occur. 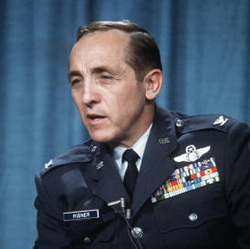 As storm clouds gathered over Southeast Asia in 1964, Risner arrived in the region, as if on cue, to take command of a fighter-bomber squadron in preparation for the larger war nearly everyone saw coming. Air warfare over North Vietnam began in earnest in February 1965, and for Risner ended on September 16 of that same year. Between those dates he flew 55 combat missions wreaking havoc on targets the length and breadth of the country. 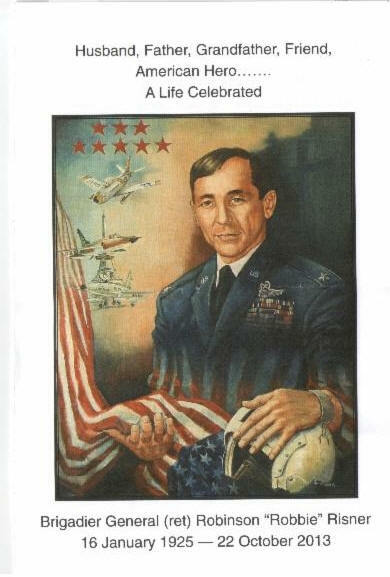 He was shot down by ground fire once (but not captured), received the Air Force Cross and made the cover of Time. He became in the eyes of others in the business one of two things: the perfect role model, or just plain crazy. All, however, held him in awe. Then, in the most unlikely circumstances, came true greatness. Sometimes in history a man emerges whom no one saw coming, one who rises to the awful challenge of crisis leadership when others are faltering, and provides exactly the right strength of character, calming influence, and credible guidance out of the morass. But first he must earn the respect and commitment of his subordinates by demonstrating a personal willingness to assume any risk, physical or moral, that he might later ask of his followers. Joshua Lawrence Chamberlain was one such a man. A shy young professor with a speech impediment who taught modern languages at Bowdoin College before volunteering for Union service in the Civil War, who lacked even basic military knowledge. But he schooled himself quickly to a remarkable level of competency, helping to raise and later command the 20th Maine. Fate placed Chamberlain and the 20th Maine on Gettysburg’s crucial high ground on July 2, 1863, ground that both sides needed for victory on the following day. Against long odds, the Maine regiment repelled multiple assaults by Confederate forces. Then, out of ammunition, with only bayonets left, a wounded Chamberlain with saber swinging inspired the counterattack that saved Little Round Top, making possible the next day’s Union victory—and, eventually, victory in the war itself. Ernest Shackleton also comes to mind. A competent British seaman with a taste for adventure, but with no prior demonstration of compelling leadership, Shackleton’s handling of a disaster-ridden Antarctic expedition in the early 20th century unquestionably rises to a level of near-incredible leadership. With half of his expedition stranded on one side of the continent, and the other half imprisoned on a tiny barren island after their ship was crushed by massive ice convulsions, rescue seemed out of the question. Unwilling to give up or to let his crew do so, Shackleton set out in a 20-foot wooden life boat salvaged from the doomed mother ship across 800 miles of violent seas to a whaling station on South Georgia Island. Fifteen days later, after surviving hurricane force seas that sank a 500-ton ship in his vicinity, he reached his objective, then organized and led rescue operations to save his men in both locations. Robinson Risner earned a place along side these and other unexpected giants of history. Following being shot down a second time and then captured, his arrival in the old French dungeons of Hanoi began the trial of his life, but also the leadership role that would be his legacy. It didn’t take long for his captors to realize who they had, for they obviously read Time magazine, too. They told Risner there were only three people they would rather have as a captive: Lyndon Johnson, Robert McNamara or Dean Rusk. For the next 7½ years Robbie absorbed levels of torture and abuse those three could likely never have grasped, let alone endured. At the time of Robbie’s capture there were 27 other Americans incarcerated in Hanoi, separated from each other, all doing their best to abide by the Code of Conduct for American Fighting Men. Once Risner determined that he was the Senior Ranking Office, he began to put structure and guidance into the POWs’ lives, a sense of order and community, the very thing their captors were trying desperately to prevent. He would pay a terrible price for that leadership when the guards would catch him communicating, but they couldn’t stop him. No matter how brutal the beatings, the next day he would be at it again. Later on as the POW organization grew, and prisoners were taken to other prisons throughout the country, Risner’s guidance would expand and continue to spread. Always it would make sense, be crisp and to the point. It was never threatening, always gentle and optimistic, like a loving father giving guidance to his son. Yet all he did remained in a military framework, based on the core principle that we were fighting men with a code of honor that must be upheld. Risner became the inspiration for all of us confused and scared young men in a very hostile environment. He was a guiding presence, a behavior yardstick, and he managed to achieve this without direct contact. He somehow conveyed in a bizarre, tap code communication system what was the right thing to do in order to survive with dignity and honor. None of us quite measured up to his standard, most likely. But there is no doubt in my mind that every last one of us stood taller in his shadow, tougher in our resistance, and came home better men as a result. May God bless you Robbie Risner, and may you rest in peace.